Inspired by the Creative Revolution E-Course and my ongoing quest to weave more creativity into everyday life, I’ve put together thirty fun prompts for you to explore during the month of September. Download the PDFs today in my blog! It took me years to find the words to describe some of the philosophies I use in my Brave Intuitive Painting process. In this week’s Hey Flora Episode, I’m happy to share this golden nugget with you. In this month’s Painting Session, I decided to step out of my comfort zone by embracing the world of pure abstraction, and I learned so much. What I found really interesting was how free this process actually made me feel. Take a peek inside! I’M TEACHING AT 1440 MULTIVERSITY! 1440 is designed to invite more presence, awareness, and connection to what really matters in life, and I’m honored to be teaching a collaborative workshop with my dear friend, Cvita Mamic, called Beyond the Surface, October 15th – 20th. Today on the blog I share my thoughts on loss, sadness, reverence, and gratitude. For as much as these moments hurt, they also invite a deep sense of connection to my own aliveness and compassion. Read more inside. CELEBRATING ONE YEAR OF INTUITIVE PAINTING ON CREATIVEBUG! It’s been so fun to share my approach to painting with the Creativebug community over the past year and to see so many people from around the world discovering their ability to paint intuitively. Learn more here! If you’ve ever struggled with finishing a painting or have a stack of unfinished paintings lying around, you’re not alone. If you’re interested in letting go of the old and welcoming the new, check this video out! NEED UPLIFTING? CHECK THIS ONE OUT! With the constant onslaught of heartbreaking news, it’s easy to feel fearful and overwhelmed by the state of the world these days. It’s more important than ever to feed our souls a daily dose of uplifting stories, meaningful experiences, and creative inspiration. We filmed this Session right after I taught a brand new workshop in New Mexico, so I was feeling all kinds of inspired to try out some new ideas. If you’re interested in moving in new directions in your work, check this video out! If you’re seeking more freedom in your creative expression, you’re not alone. Today on my blog I share a downloadable PDF with my favorite tips to invite more freedom into your paintings! Do you ever feel like you’re in a creative rut? As a person who’s been painting for twenty-five years, I know I’ve been in many a rut over the years, but I always seem to dig myself out, and here’s how. Today I share about how I’ve been getting the creative juices flowing again! Today I’ll share with you a way I’ve found to integrate simple acts of creative living into my everyday life called Visual Feast, and it’s all about seeing your world through a fresh lens. Enjoy! WHY DO WE MAKE ART & HOW DO WE STAY INSPIRED? Why do we make art? How do we stay inspired? Today in my blog I share a series of prompts to dive deeper into these questions, and my personal reflections in the video inside. WHAT ONLINE CLASS IS FOR ME? For the past seven years, I’ve been pouring my heart into the creation of four innovative online courses, and I’m truly so proud of each and every one of them. Each one is unique, and today I’ll guide you through choosing the perfect course for you! As a creative guide, I often hear people express a deep desire to find their unique style of artistic expression, and I understand. To support you on this journey, I’ve put together a list of ten simple things you can do right now to unearth and nourish your one-of-a-kind creative expression. This episode of The Painting Sessions offers a fun departure from the past six episodes. The whole experience was one big playful experiment. I hope you enjoy this video sneak peek! WHY I HITCHED A RIDE INTO A DISASTER ZONE: MY FIRST PUBLIC SPEECH IS ONLINE! Last year, I was asked to give my first public speech. Since LOVE was the theme, I decided to share (for the first time publicly) my story of hitching a ride to New Orleans and doing six-months of disaster relief work on the Gulf Coast after Hurricane Katrina — all while living in a makeshift tent. Listen to the whole story here. There comes a time when you need to share the goods. That’s what today’s blog is all about — my own little curated list of goodies that are invigorating, inspiring, and generally soothing my soul lately. Enjoy! EPISODE FIVE OF THE PAINTING SESSION: SNEAK PEEK! In this session, I dive into my Brave Intuitive Painting Process. As always, there were many unexpected twists and turns along the way, and I’m happy to share it all with you in this month’s Painting Session. It’s time for a little show and tell. The first week of the Creative Revolution E-Course has been so fantastic! And today I’m excited to give you a little peek inside the revolution by sharing some of the words and creations of my students. 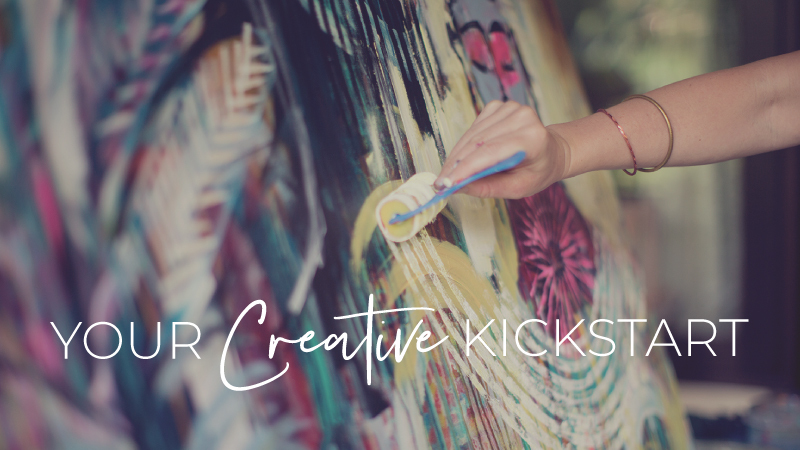 Today, I’m sharing a little sneak peek inside my new Creative Revolution E-Course to give you an idea about what it looks and feels like. It’s one thing to paint, sing, or dance (an AMAZING thing, of course! ), but it’s a whole different ball of wax to weave your creative spirit into every aspect of your life. Learn more inside! EPISODE FOUR OF THE PAINTING SESSIONS: SNEAK PEEK! I’m happy to share a little sneak peek of Episode Four of The Painting Sessions. This painting was inspired by all the little paintings I’ve been doing at home lately. I started the first layer by using an exercise I call, Musical Lines, and it definitely provided a pretty exciting breakthrough for me! With the constant tsunami of information coming at us these days, creating personal “sanctuaries” to refuel is essential. Learn more in today’s blog! I’ve never been able to sit still for very long, and if you’ve ever watched me paint, you’ve probably noticed I like to dance my way across the canvas. I made a little video to offer you a Mini Movement Exercise to play with right now! I believe shifting creative gears is an essential part of staying inspired and developing your own unique style. Discover a fun creative exercise in today’s video in my blog! MY CREATIVE LULL + CURRENT BREAKTHROUGH! I gotta be honest with you, I haven’t felt super inspired to paint for the past few years. Yikes, I said it. However, I have been examining what kinds of shifts might get me back in the flow. I can’t wait to share my breakthroughs with you! EPISODE THREE OF THE PAINTING SESSIONS: SNEAK PEEK! I’m happy to let you all know that Episode Three of The Painting Sessions is ready to roll, and it’s a goooood one! Enjoy this sneak peek. Who’s ready for a brand new year? I am. I am! I believe that strengthening our brave, intuitive muscles (both on and off the canvas) is more important than ever before, so to give you a little jumpstart of creative inspiration I’m happy to share some of my favorite videos with you. If you’re looking for some fresh podcast action, I’ve got ya covered with some of my favorites, as well as some of your favorites compiled from a recent Facebook post on this very topic. If you’re looking for gifts that are incredible to receive, while directly supporting the makers, doers, and creators behind them, I’ve got some ideas for you! Supporting artists and changemakers who spark inspiration, catalyze change, and create products that soothe the soul feels like an act of love and justice in itself, and I’m happy to share some of my personal favorites with you here. I went to my studio last weekend to paint out the knots in my stomach and to give my anxious thoughts a place to rest. I went there because painting has always been my medicine, and more than ever, I’ve been feeling called to paint it out. But what does “painting it out” actually look like, and how is this different from any other day in the studio? Today is the first day of The Painting Sessions, and I’m super excited to finally share this new offering with you! To give you a little glimpse of the very first episode, we put together this short video for you. There’s something pretty magical about watching an intuitive painting come to life from start to finish. To offer you a front row seat to this mesmerizing experience, I’ve created a unique online offering called The Painting Sessions. Join Orly and I in the studio as we consider the topics of honesty, vulnerability, and bridging the gap between how we live and how we create. After much consideration and reflection on your feedback, I’ve decided to make a few really exciting shifts in my monthly offering. Starting on November 1st, Studio Diaries will be called The Painting Sessions, and the focus of each month will be on…you guessed it…painting! For years, when folks asked me the meaning behind my paintings (which they LOVE to do), I struggled to respond – feeling like I needed an intellectual answer to explain the meaning behind my work. I’ll dive into this hot topic in today’s video! September’s Diary is all about Creative Business with Heart. In this Diary, we’ll dive into my favorite practical and intuitive tools to support a soulful, sustainable and successful creative business. Every Diary also includes a special Diving Deeper Podcast where I share my thoughts on questions from the Studio Diaries community. The podcast this month is SO full of great questions about creative business, I’m happy to share the entire recording with you right here. Enjoy! In this week’s Hey Flora, I answer a question from Grace, who writes in about the delicate dynamic of receiving unsolicited feedback. Someone sees your painting and spontaneously begins to offer tips, critiques, and ideas. Sometimes this advice is absolutely welcome, and sometimes — not so much. If you’ve ever wondered how to move through your creative blocks, this “Hey Flora” is for you! I often hear people say that FINISHING their intuitive paintings is the hardest part of the process. And I totally get it. I would LOVE to help you all with this, so in this week’s Hey Flora episode, I’m offering up a few helpful tips about finishing intuitive paintings. Friends. I’ve been keeping this excitement under wraps for awhile, but today is the day I finally get to share it with you! A few months ago, I had the pleasure of filming a three-part Intuitive Painting class in my Portland studio with the fine folks from Creativebug, and my first class is launching today! HOW TO SELL PAINTINGS AND KEEP THE IMAGES FOREVER! If you’ve ever thought, “I can’t paint, because I don’t have the space to paint,” it’s time to get creative with your creative space! Consider where you might be able to carve out a little space for yourself? Do you have an extra room, garage, patio, basement or attic? Perhaps you have a friend who could easily lend you a little extra space or happily go in on renting a shared space? Even if you’re painting on a kitchen table, in the corner of your bedroom, or in your backyard, cultivating physical space in order to create is one of the most powerful things you can do to support your creative habit. In this week’s Hey Flora episode, I’m sharing a few basic tips to help you get your painting space up and running. One of these tips took me YEARS to figure out, so I’m thrilled to pass it along and save you some time! I recently had the honor of meeting teacher, artist, poet and founder of Intentional Creativity, Shiloh Sophia. I’m guessing many of you already know Shiloh, but if not, I’m honored to make the introduction. About a month ago, Shiloh was in Portland teaching a workshop in my studio, so of course I had to steal her away to record a couple of couch chats in my living room. As suspected, we hit it off like dear old friends. I love how this week’s Hey Flora question is disguised as a painting question, but can actually be applied to life in so many ways. This is a great question for anyone who paints in layers or anyone who struggles with simplification in life off the canvas! In this video I offer a few super simple tips about the magic of translucent paint, letting go of what you like, focusing on what you love, and working with what’s working. I could happily riff on these gems for days, but I’ll keep it clear and to the point in this week’s Hey Flora Episode. HOW THE HECK DO YOU TITLE A PAINTING? Hi everyone! In this week’s Hey Flora: Weekly Tidbits for Your Creative Adventure, I’m answering the question, “How do you title your paintings?” from Elias. While there is certainly no formula for how to choose a title for a painting (in fact, titling your paintings is totally optional! ), I’m happy to share a few of my own tricks for what can sometimes feel like tricky territory. CREATIVE REVOLUTION PRE-ORDER GIVEAWAY WINNERS ANNOUNCED! We’re Kinda Blown Away Over Here. Thanks to you, my second book, Creative Revolution: Personal Transformation through Brave Intuitive Painting, has been sitting at the TOP of the “Hot New Releases in Acrylic Painting” list for the last two weeks! Seriously you guys, what an honor. THANK YOU for trusting in this new vision and for pre-ordering the book months in advance. I cannot wait till you have it in your hot little hands. JACKIE WOOD + JOANNA PRICE + LOUISE WARD. CONGRATS TO YOU ALL!